Would you like to find the telephone number of a specific company near your home? Do you want to do it for free, in a very simple way? In that case, this site might be a good option for you to keep in mind. Tollfreeda.com is the official website of Toll Free Directory Assistance, a good source for you when it comes to toll-free telephone numbers. The site’s homepage gives you two options for doing your search. One is by company name to find out the number you need and call right away. The other is a reverse search, by which you enter some number and find out which company has it. If you include your area code when searching by name, you will get both nationwide and local results. The “Search Tips” button will take you to a page where you can read about the best ways to enter the search criteria. For example, when you are looking for a Federal Agency, you should enter the term US and then the agency’s name. In case you need to search for a state agency, the postal abbreviation before the term you want to look will help. If you are not sure, the site provides you with the list of state abbreviations. Similar tips are offered for looking up acronyms or also for companies that are known for more than one name. 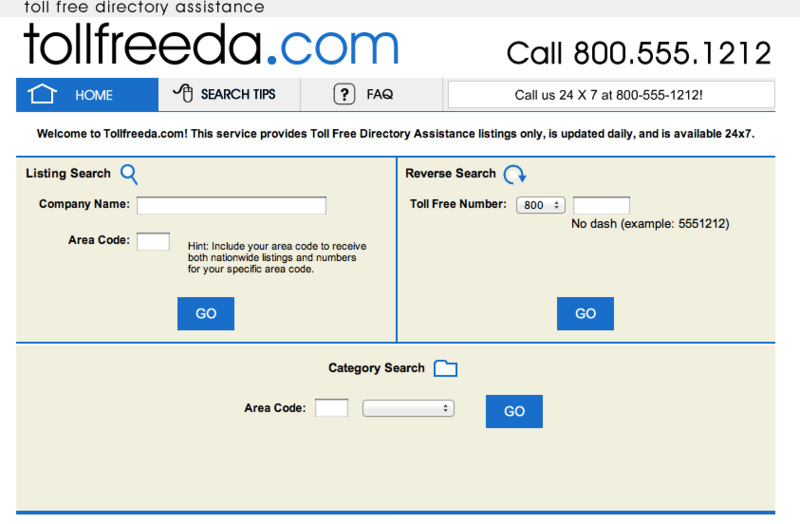 In case you want to find a telephone number in a very simple way, you might want to take a look at Tollfreeda.com. The FAQsection will give you more details about the site’s service, and warns you that although you call a toll free number, your mobile phone carrier could charge you. Finding out these detail will save you from unexpected charges. Toll Free directory is a free service, however you may wish to check with your cell phone provider for any fees that they may choose to apply. Finding free phone numbers should not take very much time, because sometimes late is too late. So Tollfreeda.com provides the resource for getting on time the number you need. Will they post regular numbers or will they keep the service as it is?